Once you’ve found a fertility doctor, you’ll start the first step, which is doing diagnostic testing to understand more about your individual situation, and how your body is likely to respond to fertility medications. This step can often take longer than patients might like, as some tests must be conducted on certain days of the menstrual cycle, and some are more accurate if you’ve spent time off of hormonal birth control. 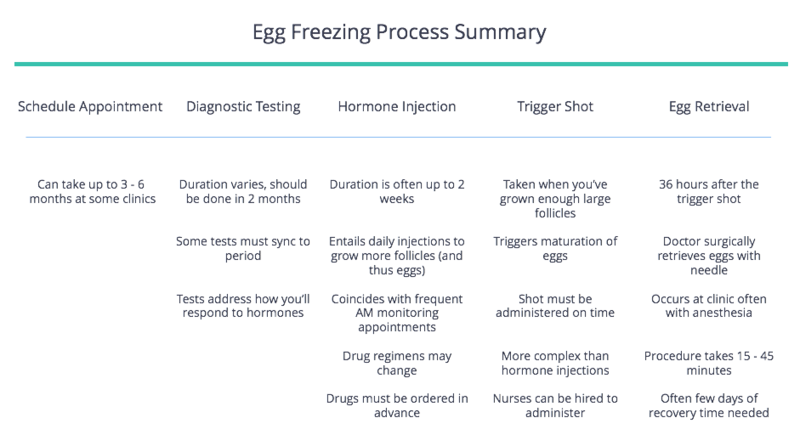 Basically the goal of the tests is to understand: if you take hormones, how many eggs will you likely produce for your doctor to collect and freeze? Once that’s taken care of, if you decide to move forward with egg freezing you will sync up with your doctor to plan a likely calendar for your cycle -- this can ultimately depend on when you happen to get your period, or your doctor might start you on birth control pills so that there’s more clarity on when a cycle will start. This phase also includes the nontrivial step of ordering medications. It might sound easy, but ordering fertility medications isn’t just your usual trip to Walgreens -- you’ll likely need to think this through in advance, oftentimes placing an order from out of state, and carefully taking stock once everything has arrived. You’d be surprised how many cycles cannot start because a medication or a piece of equipment didn’t show up on time. The second phase, in almost all cases, will mean that you begin administering daily injections of hormones, with the aim of helping your body to produce a large number of eggs. While women have several follicles on their ovaries, typically only one is selected for maturation and released in a given month. The goal of the fertility drugs is for all the follicles on your ovaries to produce mature eggs. In this phase, there’s very little room for negotiation around schedule -- your body’s timing and doctor’s planning will dictate the schedule. Over the next week to two weeks, you’ll probably be injecting yourself every evening with hormones -- this part can feel pretty daunting, so many women choose to have someone help, whether it’s a friend, family member, or a nurse who can come administer the medications. During that time, you’ll be going very frequently to the doctor for monitoring, where they’ll do pelvic ultrasounds to check on the growth of your follicles, and also run blood tests to check your hormone levels. This will inform potential changes to the drugs you're taking, the dosing, and the timing of your eventual surgery. When the follicles on your ovaries are large enough, your doctor will instruct you to take something called a “trigger shot.” This shot has to be administered at a very specific time (you’re usually given a time window of only a few minutes), and it can be more complicated and stressful to administer than the earlier medications. If there’s one shot to have help with, this is it! Almost exactly 36 hours later, you’ll be back at your doctor's office for the third step: surgically retrieving the eggs. Most practices use general anesthesia, though some use a local anesthesia, for this short procedure that lasts roughly 15 to 45 minutes. The doctor will use a needle, guided by a vaginal ultrasound, to suction out the fluid from each of your follicles. The hope is that each follicle contains a mature egg. The surgery is an outpatient procedure, so you’ll be able to go home fairly quickly after it’s finished. As far as recovery, most doctors will say that the average recovery is minimal and women are back at work the following day. Almost every woman we speak to, though, reports a recovery that’s a bit longer and more painful than that -- they say it takes several days to feel pain free and back to normal. The fourth step is actually freezing those eggs. In the surgery room, the doctor will be passing the fluid extracted from your follicles to an embryologist, who will examine it to see if there are mature eggs. Any mature eggs they find will be cryopreserved, or frozen. In recent years, the predominant way that top labs do this is through a fast freezing method called vitrification. Your eggs will then be stored by your fertility clinic until a time when you might choose to use them. The answer lies in the last phase of this process: using those eggs. Using these eggs takes us into the IVF funnel and IVF, unfortunately, is an incredibly inefficient process. There are many hurdles that an egg must overcome to become a healthy baby and, in the IVF process, there’s usually substantial drop-off at each point. And, importantly, there is no way to test eggs, on their own, to understand their quality. So, if you choose to use them, your eggs will need to survive thawing, be successfully fertilized with sperm, and cultivated into embryos over the period of several days in the lab. Those embryos need to develop well and be chromosomally normal if they are to have a chance at a viable pregnancy. Finally, those embryos must be transferred back into the uterus, successfully implant, continue to a healthy pregnancy, and eventually result in a live birth. 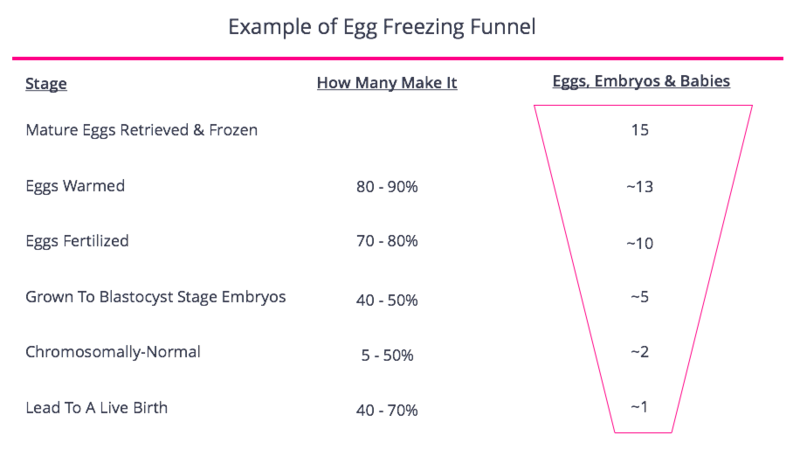 Knowing the number of steps, and how quickly the funnel can narrow as you go between them, it becomes important at the egg freezing stage to collect and freeze as many eggs as possible. On average, most egg freezers will end up doing multiple cycles to retrieve enough eggs to feel good about the result. Ask your doctor if there’s any diagnostic testing you can do before your first visit so that you can save time and have a more substantive and personalized first meeting with your doctor. Once you plan to enter a retrieval cycle, make sure you’ll have a flexible schedule for at least a few weeks - there’s not much room for negotiation around things like monitoring schedules (often these appointments are in the mornings), and there’s nothing you can do about when you need to take a trigger shot and schedule a retrieval surgery.Ask your doctor if there’s any diagnostic testing you can do before your first visit so that you can save time and have a more substantive and personalized first meeting with your doctor. Prepare for a several day recovery following egg retrieval surgery. Most doctors say you’ll be back at work the next day, but most patients disagree, so don’t let that surprise you.